Ring in the new! I do enjoy reading posts in which bloggers show off their proposed reading for the month but have never been able to do this myself as most of my reading is dependent on what I find on my weekly library visits. However, I find 2013 begins with a small pile of books, a mixture of my own and from the library, ready to go. 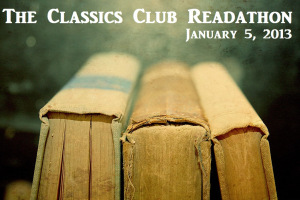 Clayhanger by Arnold Bennett is my Classics Club choice for January and I would like to make a start on Middlemarch by George Eliot which will be a long term read throughout the year. Any of the above will be perfect for The Classics Club readathon this weekend. I've never been this organised. I don't know that I want to be this organised or whether it will work but I do know that I want to read all of these books so no harm in giving it try. I'm very tired after two lovely but exhausting weeks of family celebrations so will be relaxing and starting the year with light and easy reads. I wish I could join in the month of re-reading. I know as I'm packing my books up I'll be very tempted to settle in with old favorites - and not just to escape the tedium of packing. But I'd already joined the TBR challenge - and I do need to clear those shelves off, or at least whittle them down. I hope you enjoy your quieter reading time! Good luck with the moving which is always a hassle. I've never been much of a rereader but I'm particularly looking forward to Wuthering Heights. You have a wonderful month of reading lined up. I particularly love Middlemarch, and I'm very curious about Clayhanger. I've only read a little Arnold Bennett, but the name is familiar. I think there might have been a television series back in the day. I hope you have a wonderful month! My copy of Clayhanger has an image from the TV series on the cover - I don't know whether it ever viewed here but I never saw it. After reading Babylon Hotel early last year I've wanted to read AB's more serious work so now's the time. Organization is fun! It is great to see what you have planned and hopefully, if you're looking for light reads to start the year, you'll be enjoying the Katie Fforde soon. I really enjoyed it last year. I'm reading Katie Fforde now - not at all my usual sort of book but it is light and lots of fun. Perfect for relaxing. I like being somewhat organized, but with room to do as I please if my mood changes. I have left some space for a mood change which I can guarantee is sure to happen sometime during the month. I read The Grand Babylon Hotel last year which was one of his mysteries he churned out to make a living but I'm looking forward to trying his more literary work. Looks like you have some great reading lined up. Wish I was as organized as you. Wow, I don't realize that Middlemarch is such a thick book!